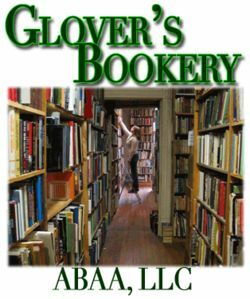 Glover's Bookery, ABAA, LLC; Bookseller Since 1978, store hours : Tues - Sat 10am - 6pm EST 859-253-0614, orders@gloversbookery.com 862 S. Broadway, Lexington, KY 40504 Terms: US$ by check on US bank or Visa, MC, or Amer Exp;all personal checks held for 10 days before item(s) can be shipped; 10 day return for any reason. All items subject to prior sell. Ship/hnd: multiple volume sets counted by the book (ie. 4 vols = 4 books). Some oversize books may require additional shipping. If so we will notify you with options before your order is processed. All order have free Delivery Confirmation and on line tracking. USPS BOOK RATE (2-20 days) $4.50 1st book, $1 each additional book; PRIORITY (2-7 days) $11.95 1st book, $4.00 each additional book; INTERNATIONAL FLAT RATE PRIORITY (5-15+ days), where available $22.00 per book; may be less or more depending on size of book. INTERNATIONAL AIR (7 to 20+ days), quoted **All International orders may be delayed due to customs beyond the quoted delivery times** We will bill libraries and institutions on 30 day terms with your Purchase Order number.